Nursing, the largest of the health care professions, is a key player of the whole health care team. Nurses play a unique role by providing both direct and comprehensive care to patients and their families that includes the physical, psychological, social, and spiritual dimensions of illness and wellness. 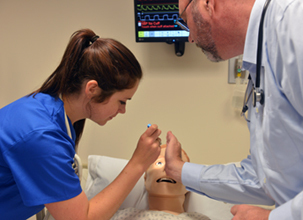 Nursing provides tremendous opportunities for a variety of challenging and rewarding careers. You may choose to work with a particular age group (babies or the elderly); a particular illness (cardiac or cancer); or in a particular work setting (hospital or home). Hospital nurses have the option of specializing in areas such as critical care, obstetrics, operating room, pediatrics or the emergency room. Staff nurses, legal-nurse consultants, researchers, case managers, educators, community health nurses, entrepreneurs, and directors of nursing illustrate the many diverse roles of nurses today. What can nursing offer you? Nursing Shortage in the U.S. Prospective students have many options for pursuing their education at different levels, each of which offer different opportunities in terms of profession, specialty, and salary. View a guide that explores everything aspiring nurses need to know about nursing schools, from how to choose the right college to degrees and specialties to firsthand insight on programs from a college administrator.